This is a fabulous, high quality, Art Deco jewellery box, dating to the 1930s. It stands high upon a beautiful plinth which has space within it for further jewellery storage or special letters and photos. The interiors of the box and plinth have been beautifully refurbished by our skilled box restorer. Further details of this are given below. 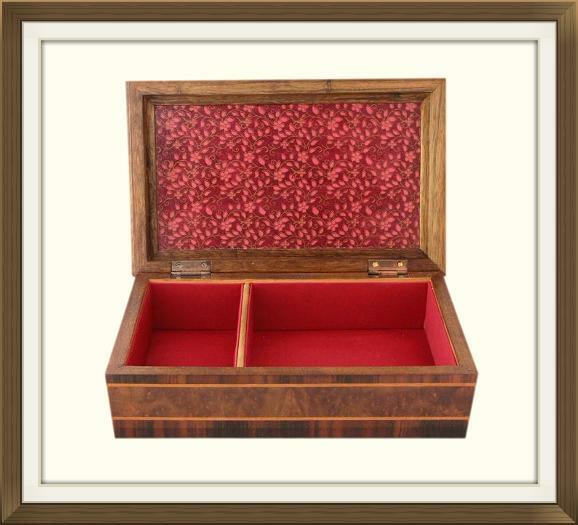 The jewellery box is made of solid Oak. 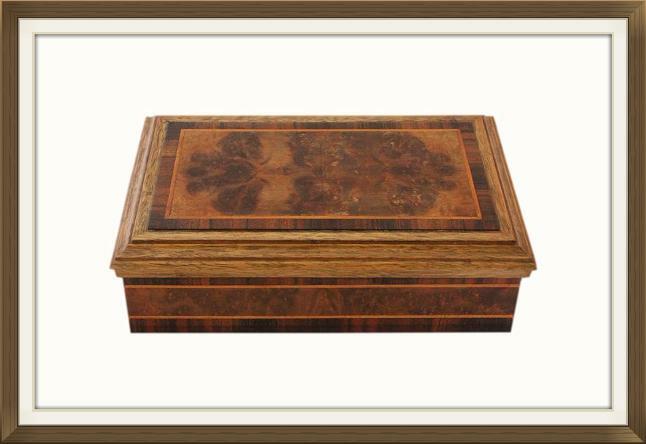 Its lid has a superb 'oyster cut', Walnut veneered panel, and there is also a beautiful band of Burr Walnut veneer around the body of the box. 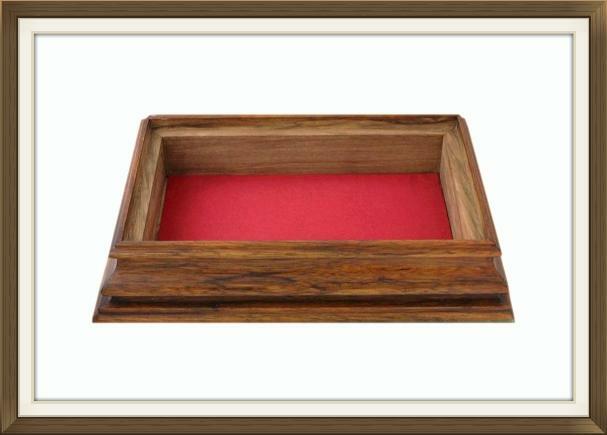 The panel to the lid is raised and is beautifully finished by veneered frames of Satinwood and Rosewood. 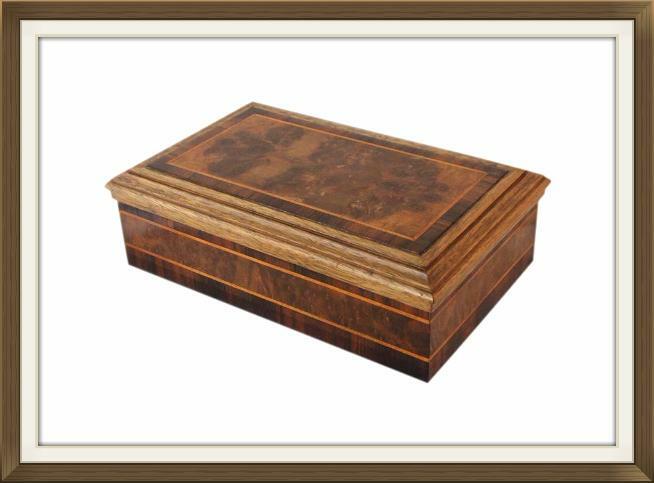 The body of the box is also beautifully finished with veneered Satinwood stringing and veneered Rosewood bands. 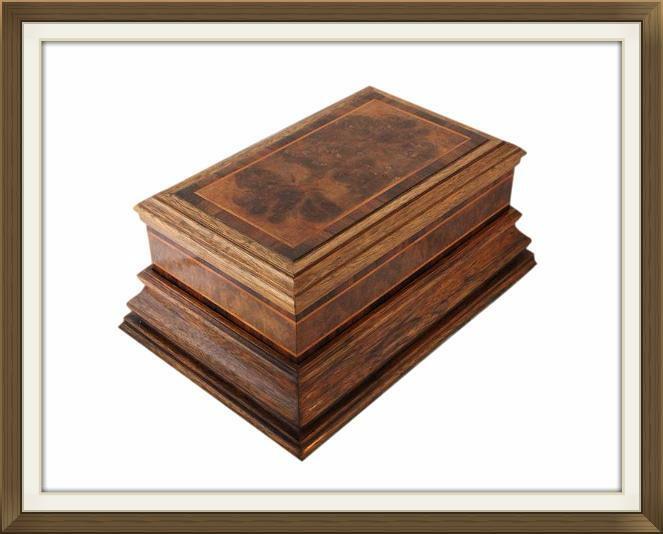 This is very decorative and matches the veneered frames on the lid. 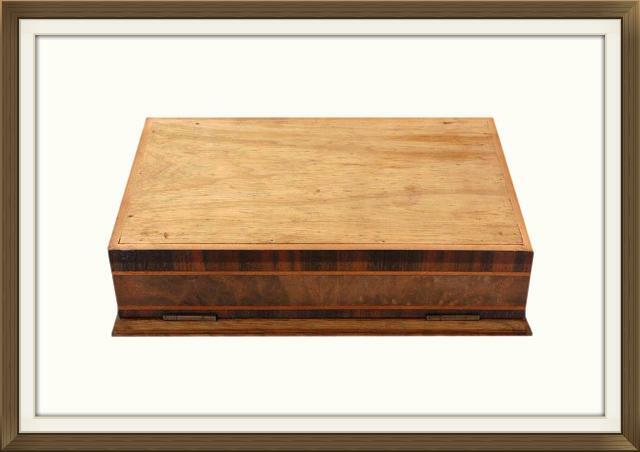 The box has a beautiful streamlined design and is complete with its original hinges. Its lid has a beautiful stepped formation, this being a very popular design during the Art Deco period. The plinth is also made of solid Oak. This too is stepped and has beautiful curvature around the centre. 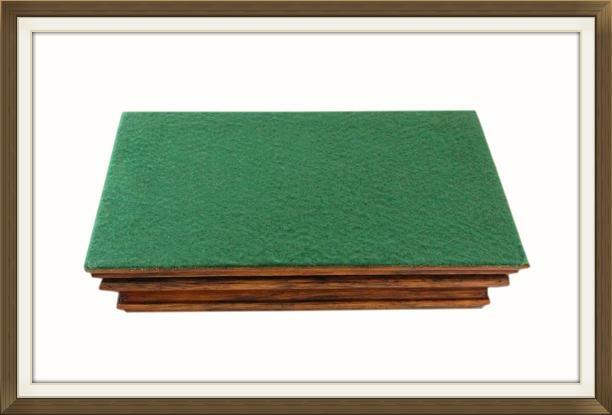 A new soft green felt covering has been added to the base to protect the surfaces of your furniture. The Walnut to the panel on the lid has been skillfully 'oyster cut'. This is a rare technique of cutting wood whereby selected branches are saw cut, usually at an approximate angle of 45 degrees. 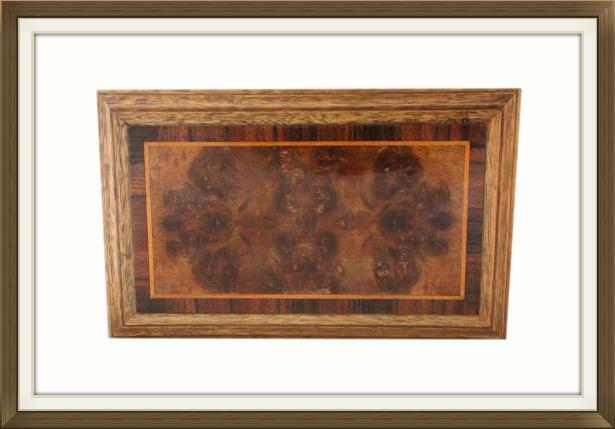 This cut incorporates both the light sapwood and the denser heartwood, creating a decorative oyster shell resemblance. This resemblance is where the term 'oyster cut' derived from. The interior has two newly refurbished storage compartments. These have beautiful 'Raspberry' coloured satin panels and linings. The panels to the bases are padded. The inside of the lid has been newly relined with high quality floral paper. This has pretty pink flowers upon a plum coloured background, and is beautifully finished with gold highlights. This has also been newly refurbished. It too has a Raspberry coloured, satin padded panel, which matches the panels in the box. 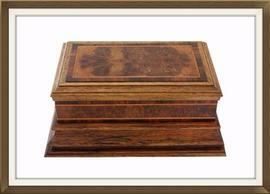 This box and its plinth are in extremely good condition for their 80 plus years of age. All of the veneer is present and intact, and the box and plinth are of sound structure. A tiny amount of Rosewood veneer has been re-glued on the back of the box. This is barely noticeable as it is in an inconspicuous area, right at the bottom and near to the corner. The hinges are still in good working order. The top two screws on the right hinge are replacements. These were replaced to add greater security to the hinge, as the originals were quite worn. The interior satin linings and paper, being new, are in excellent pristine condition. 12.6 by 7.3cm with a 4.6cm depth. 14.1 by 12.6cm with a 4.6cm depth. 22.6 by 12.9cm with a 3.9cm depth. International postage is by Parcelforce Global Priority. Delivery is fast within 3-5 working days to Europe and 5-7 working days to the rest of the world.